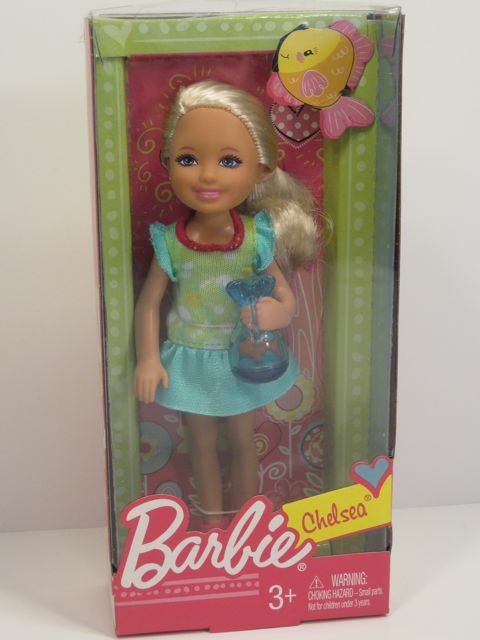 I was so charmed by the cuteness of Chelsea, that I decided to buy a few of her friends. I was especially interested in the chameleon and hamster pets, because those seem a bit more exotic than the bunny, dog and cat. I am also one of those people who loves a surprise. I get insanely curious when I can't see something about a toy until I open it up. The hamster and chameleon pets can't be seen very well through the boxes, so they were kind-of irresistible to me. By the way, I also like cereal boxes with toys in them and toy capsule vending machines. Those kinds of things. 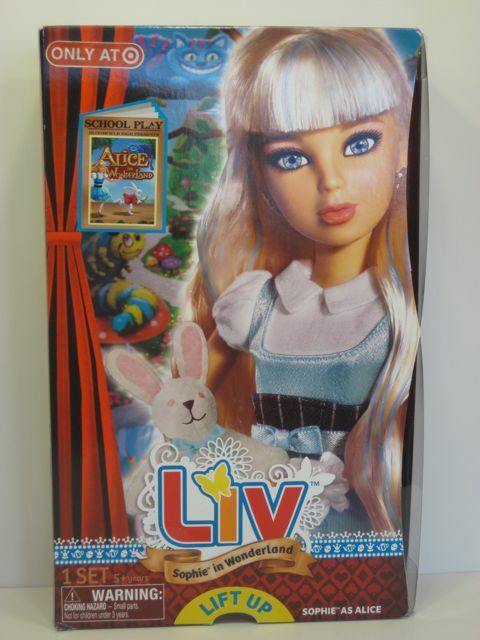 The Liv in Wonderland series is an exclusive set of Liv dolls that was made for Target starting in summer 2011. The dolls are dressed in their costumes for the school play, Alice in Wonderland. They all seem to have gotten leading roles. Although the title of this release obviously refers to the Alice play, the "wonderland" part just makes me think of The Wonder Years TV show and in the back of my head I am thinking that this was how good Liv dolls were back in their wonder years. That's silly of me, since we don't even know if Spin Master has completely abandoned the old articulated bodies, but it's just how I feel. I miss the old days. Liv Sophie as Alice in Wonderland. 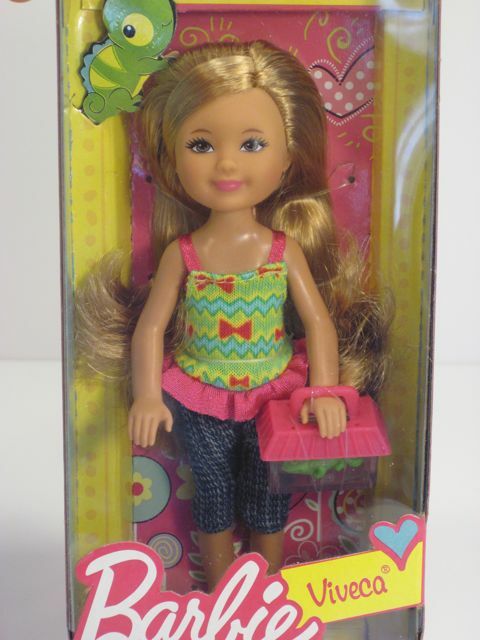 I heard about the brand-new Make it Mine ("MiM") company and their debut doll line back in December on Terri's blog. The first thing I noticed about these dolls was that they have a centaur body option. That's not something you see every day. As a person who likes dolls and horses quite a lot, a centaur doll has always been near the top of my list of things to add to my collection. There aren't a ton of centaur dolls out there, though. SOOM of Korea made an exquisite unicorn centaur doll a while ago (gasp! ), but if you pile all of the different options and extras for him into your shopping cart (because I would want everything in those pictures!) it gets really pricey. And he's sold out. SOOM also had some smaller wood centaur dolls that were less expensive, but also less impressive. Domadoll has a cute centaur, too, but I am not sure if it is still available for order. Jpop Dolls has a relatively inexpensive centaur BJD named Elise who has especially nice horse parts. I think there was one other very well-done BJD centaur on my radar, but I've forgotten where I saw it. The MiM doll with a centaur body can be yours for about $134, making it the least expensive articulated centaur doll I have seen to date. I think that the best thing about Monster High dolls is the creativity behind their design. 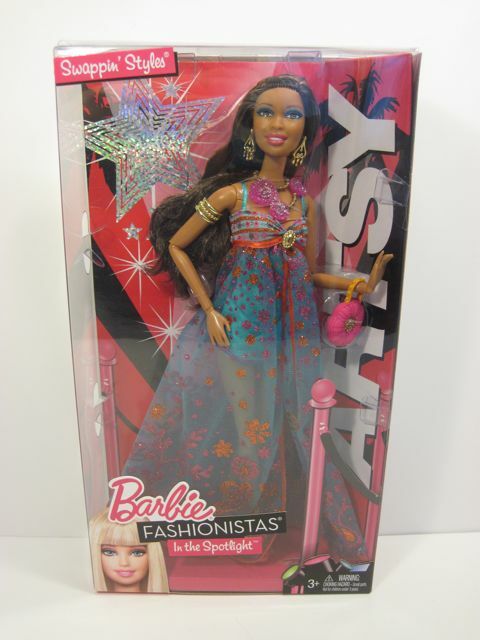 Each new doll has a fascinating and unique character with a wardrobe and accessories intricately matched to a theme. When the "Create-a-Monster" line of Monster High doll kits was announced, it seemed like another in a series of innovative ideas from Mattel. Why not let the buyer have a part in the design of these fun dolls? Sell the raw materials and let everyone share in the excitement of creating a new monster. I was definitely looking forward to getting my hands on one of these toys. When I saw that there was a starter pack that included parts for a dragon doll, I was giddy. I love dragons. Once I got a peek at the scaled limbs and green wings that are included in this set, it became an absolute must-have for me. There are two starter sets for the Create-a-Monster line, the Dragon and Werewolf set and a Vampire and Sea Monster duo. They retail for $26.99. These starter sets include all of the parts to make two complete dolls with the irritating exception of there being only one torso. I was disappointed to learn that the dolls have to share a torso, but I assumed I could use the torsos from other Monster High dolls, like my wonky-eyed Lagoona, and that in the end there'd be plenty of body parts to go around. Monster High Create-A-Monster Werewolf & Dragon set. Pullip Dolls by Cheonsang Cheonha for Groove, Inc.
"Pullip" is the name of the main character in a line of large-headed 12" fashion dolls created by Korean artist Cheonsang Cheonha. I think the name Pullip means "young leaf." The history of these dolls is a little confusing for someone like myself who became interested in the dolls only recently. Pullip dolls were first made in 2003 by the Japanese company Jun Planning. In 2009, Jun Planning of Japan filed for bankruptcy, but left their American branch, Jun Planning USA, open and operational through 2010. Jun Planning USA shifted the handling of their Pullip doll releases to Korean-based Groove, Inc and now the Jun Planning USA website seems out of date and all of the new Pullip dolls have "Groove, Inc" on their boxes. Despite this switch, you will still occasionally see Pullips referred to as "Jun Planning dolls." 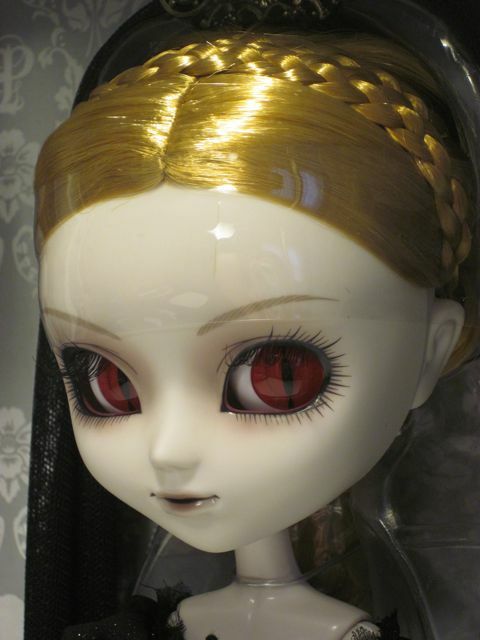 The details of the Pullip dolls themselves are also somewhat confusing to a newcomer. The Pullip character has a personality profile (she goes to a private school in Italy and enjoys scuba diving...) and she has a boyfriend (Taeyang), and any doll released with her face is called "Pullip." However, each individual Pullip doll also has its own unique name and personality, making it seem like a completely different character. For instance, the doll I will de-box in this review is named "Elisabeth" and she's a vampire dressed in medieval clothes. I don't think she spends much time scuba diving. So, I prefer to think of "Pullip" as just a face sculpt, and then each of the different dolls with this face is a personality all her own. Robert Tonner's Basic Cinderella is probably my favorite doll of all time. 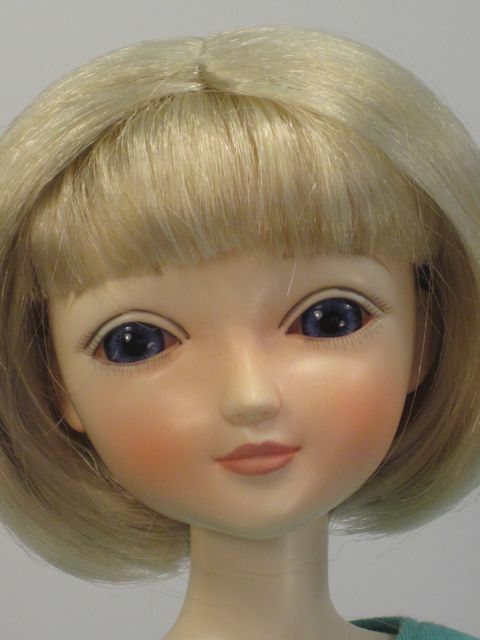 I have a huge emotional attachment to this doll and have collected almost every single Tonner doll that shares her face, including all of the newer "Cami" dolls that have a slightly re-sized version of the Cinderella face sculpt. You might remember from my earlier post that I haven't been too happy with the more recent changes in these dolls. The introduction of "Wigged Cami Too" marked the first time since the debut of the Cinderella face that I decided not to spend my money. I still have no interest in buying that doll. Right before IDEX, Tonner premiered his "Nu Mood" line of basic dolls. These dolls each have one of three body types (Curvy, Dance or Fashion) and they share interchangeable hands and feet and a mix-and-match wardrobe. This is a cool idea, especially since one of the options for the switchable feet is ballet feet. I really liked the New York City Ballet line of Tonner dolls, and seeing the re-introduction of the en pointe feet was good news for me.